People with myositis may have significant functional limitations and disability despite appropriate pharmacologic treatment to reduce inflammatory damage to their muscles. The impairments associated with myositis often result in a loss of independent ambulation, difficulty rising from a chair, an inability to negotiate stairs, and diminished health-related quality of life.1 Therefore, meaningful outcomes measures and effective therapeutic exercise remain important in the medical management of the disease. The clinician who draws upon the research literature to help formulate a disease-specific exercise prescription will be sorely disappointed. No quality randomized clinical trials (Class III studies) have been conducted to determine the efficacy of exercise as an intervention for myositis, and no exercise-based observational clinical trial (Class II studies) has featured more than 25 subjects. Given these limitations, how should physical therapists approach the examination and plan of care for the patient with myositis? Evidence-based practice incorporates the best available evidence with clinical expertise and patient values. I offer the following recommendations based on our clinical experience and insights gleaned from exploratory studies involving exercise and myositis. All physical therapy evaluations include a systems review and specific tests for the cardiovascular, integumentary, musculoskeletal, and neuromuscular systems. However, the unique demands of the patient with chronic disease require an approach that differs from the usual model of medical care in which a precipitating event—such as an injury or acute exacerbation of disease—provokes symptoms. Serial strength assessment is a critical element of the evaluation of patients with myositis. In our clinic we recommend quarterly visits for serial strength assessment to help us monitor muscle weakness secondary to disease activity and damage and alter the exercise regimen based on the findings. The manual muscle test (MMT) is the most common form of strength assessment and is listed as a core set measure by the International Myositis Outcome Assessment Collaborative Study Group.2 The MMT has well-known limitations: the grading criteria are subjective and dependent on the strength of the examiner, and large muscle groups may experience a 40% decrease in strength before the impairment is detected with MMT.3 However, the MMT remains the “language” that clinicians use when discussing strength and it has proven to be a valid measure of strength for individuals with frank muscle weakness. 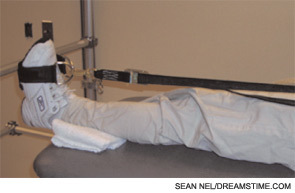 FIGURE 1: This fixed dynamometer has a plinth that allows for easy patient access and non-elastic straps attached to a frame to provide stabilization during strength testing. In our clinic, we have tried to address the shortcomings of the MMT in a couple of ways. Since summed MMT scores are more reliable than individual MMT grades, we report the percentage change in the MMT score in our patient notes and communications with physicians. At the 2005 ACR/ARHP Annual Scientific Meeting, my colleagues and I reported that the five weakest muscle groups in a cohort of 52 adult patients with polymyositis and dermatomyositis (based on MMT data collected by a single examiner) included the neck flexors, shoulder abductors, knee flexors, hip abductors, hip flexors, and hip extensors.4 We recommend use of the proximal muscle groups in summed MMT scores to capture the regions most affected by the disease and increase the responsiveness of the outcome measure. Our clinic has also elected to augment our strength assessments with dynamometry testing. But when should clinicians strive to use objective strength measurements, and what is the best dynamometry method to use?